If you’re looking for picture frame ideas, Pinterest is a really amazing resource. With way over 150 million users each month, the social media powerhouse is packed with inspiration and quality picture frames – if you know how to make the most of the platform. Our expert team has gone through the platform to provide you with the very best arts and crafts picture frame ideas that the platform has to offer. With Pinterest moving so quickly, you should be sure to regularly check back there for inspiration and keep pinning! If you have an eye for design and pay close attention to every tone and angle in your home, you’ll want to find picture frames that reflect your aesthetics. There are some intriguing options out there on Pinterest and while some of them might be too tough for DIY projects, we will be happy to take a look at it for you! Here’s a look at some of our favourite trendy picture frames from Pinterest. This is a simple way to give your picture frames a makeover. A splash of colour helps to set the frames apart from the wall that they’re hung upon. If you have the right eye for design, you’ll be able to choose the right colours and sections of the frame to paint. This will help you to create a really special and unique look for your special photos. Pairing the colour of the paint with a prominent colour within the picture is an interesting idea and it could help you to create some very unique moods. Doesn’t this look amazing? 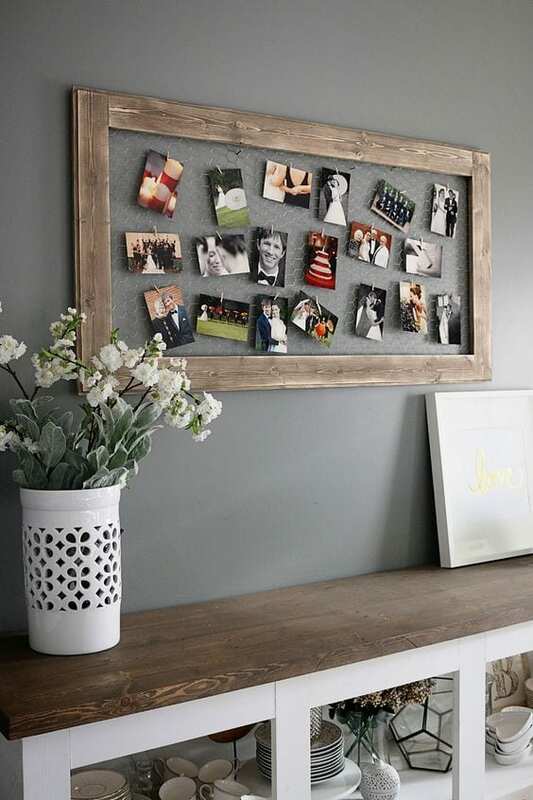 When it comes to picture frame ideas, arranging multiple frames is a great way to create an intriguing collage that demands attention. The variety in shapes and sizes means that there’s always something new to look at, and the order is certainly pleasing. There are a lot of configurations to play with and you’ll be sure to find the one that feels just right and clicks with your preferences. This particular reference has a nice spotlight that is perfectly placed to hit the top of the arrangement. Depending on what exactly you want to frame, a DIY option could be a good choice. This type of frame can help you give a personal touch to your photos and help you to express yourself. 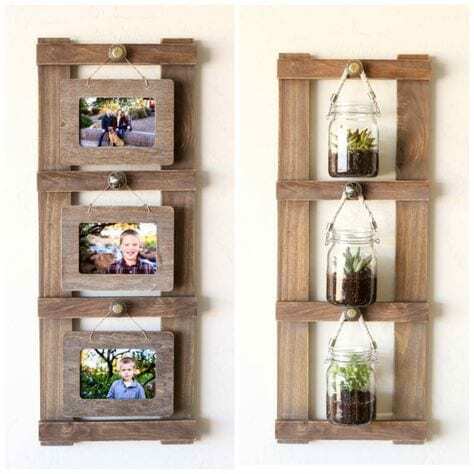 Obviously you’ll want that special and long-lasting frame for some precious items, but you should certainly give a DIY frame some thought. Pinterest is overflowing with inspiration, too! 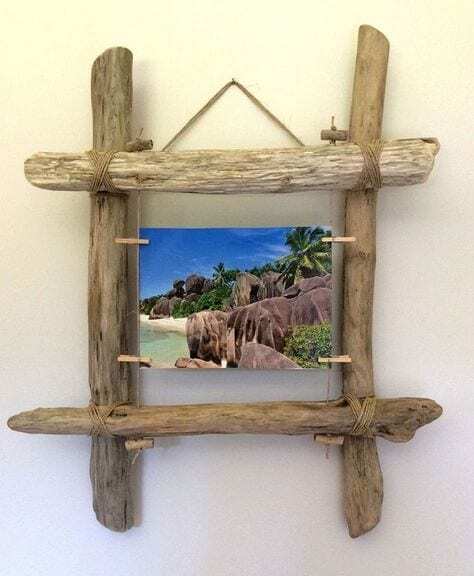 Here are some of our favourite picture frame ideas that the platform has to offer. This is a very simple and effective option that looks especially striking with the black and white photos. This is perhaps more of a photo rack than it is a frame, but by contrasting a solid frame with loose polaroids it’s a nice way to convey the emotion from the photos. Best of all, this is pretty simple to accomplish. 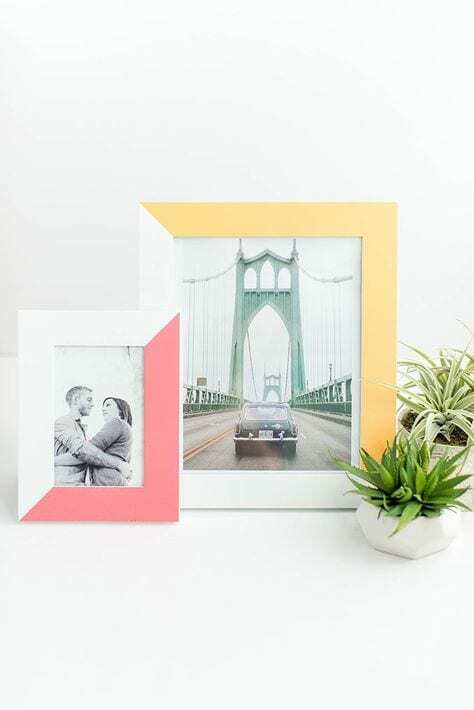 You’ll want to be on the lookout for quality material to act as the frame but other than that, it’s just a matter of hanging your photos with clips! When it comes to beauty, we each have a different view. Some people prefer an ordered and regimented frame, while others will adore this natural look. Paired together with twine and strong twigs, this frame helps to drive home the home-made aesthetic. This could be a wonderful option to showcase your own art. The trick with this one seems to be striking a balance between those twigs which are bendy and have straight lines. For the best effect you’ll want to ensure that your canvas is covered. This option looks very fun. It requires some basic carpentry skills but if you’re feeling handy, it’s something that you might be able to tackle. We particularly like how the frame can accommodate for three photos – perfect for a series dedicated to a special person. It’s also nice to see how the frame is adaptable and can be used to even display objects. 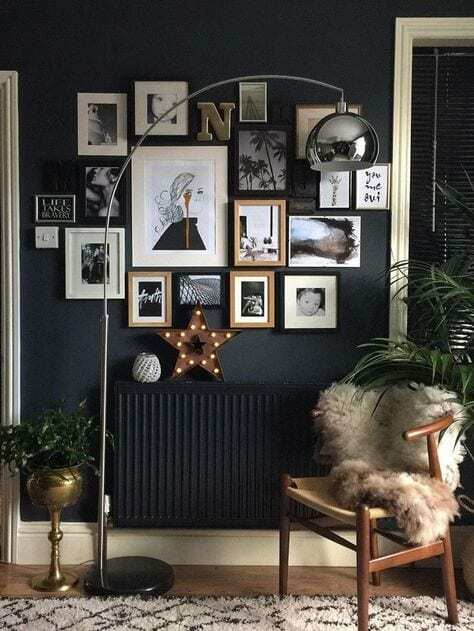 We hope that these stunning frames have helped to give you some inspiration. There really is no limit to what people create and at Frame Set and Match, we are passionate about bringing new frames to life. If you have a specific idea in mind, our experts would love to talk with you about it. It will be our pleasure to offer our years of experience to help you get the perfect frame.